Johann Wolfgang (von) Goethe (/ˈɡɜː(r)tə/, German: [ˈjoːhan ˈvɔlfɡaŋ fɔn ˈɡøːtə] ( listen); 28 August 1749 – 22 March 1832) was a German writer and statesman. His works include four novels; epic and lyric poetry; prose and verse dramas; memoirs; an autobiography; literary and aesthetic criticism; and treatises on botany, anatomy, and colour. In addition, there are numerous literary and scientific fragments, more than 10,000 letters, and nearly 3,000 drawings by him extant. A literary celebrity by the age of 25, Goethe was ennobled by the Duke of Saxe-Weimar, Karl August, in 1782 after taking up residence there in November 1775 following the success of his first novel, The Sorrows of Young Werther (1774). He was an early participant in the Sturm und Drang literary movement. 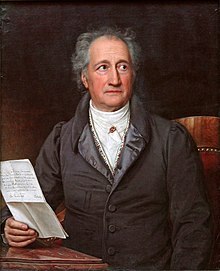 During his first ten years in Weimar, Goethe was a member of the Duke's privy council, sat on the war and highway commissions, oversaw the reopening of silver mines in nearby Ilmenau, and implemented a series of administrative reforms at the University of Jena. He also contributed to the planning of Weimar's botanical park and the rebuilding of its Ducal Palace. In 1998 both these sites together with nine others were designated a UNESCO World Heritage site under the name Classical Weimar. Goethe became also acquainted with Frankfurt actors. Among early literary attempts, he was infatuated with Gretchen, who would later reappear in his Faust and the adventures with whom he would concisely describe in Dichtung und Wahrheit. 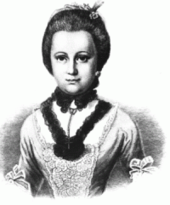 He adored Caritas Meixner (1750–1773), a wealthy Worms trader's daughter and friend of his sister, who would later marry the merchant G. F. Schuler. Days afterward, on 19 October 1806, Goethe legitimized their 18-year relationship by marrying Christiane in a quiet marriage service at the Jakobskirche in Weimar [de]. They had already had several children together by this time, including their son, Julius August Walter von Goethe (1789–1830), whose wife, Ottilie von Pogwisch [de] (1796–1872), cared for the elder Goethe until his death in 1832. August and Ottilie had three children: Walther, Freiherr von Goethe (1818–1885), Wolfgang, Freiherr von Goethe [de] (1820–1883) and Alma von Goethe [de] (1827–1844). Christiane von Goethe died in 1816. Johann reflected, "There is nothing more charming to see than a mother with her child in her arms, and there is nothing more venerable than a mother among a number of her children." The next work, his epic closet drama Faust, was completed in stages. The first part was published in 1808 and created a sensation. Goethe finished Faust Part Two in the year of his death, and the work was published posthumously. 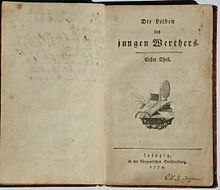 Goethe's original draft of a Faust play, which probably dates from 1773–74, and is now known as the Urfaust, was also published after his death. Though in his novel Wilhelm Meister's Apprenticeship, Goethe described the beauty of the male body, he was attracted to women, starting with his first love "Gretchen" when he was 14 and ending with Ulrike von Levetzow when he was 73. In a conversation on April 7, 1830 Goethe stated that pederasty is an "aberration" that easily leads to "animal, roughly material" behavior. He continued, "Pederasty is as old as humanity itself, and one can therefore say, that it resides in nature, even if it proceeds against nature....What culture has won from nature will not be surrendered or given up at any price." On another occasion he wrote, somewhat ambiguously: "I like boys a lot, but the girls are even nicer. If I tire of her as a girl, she'll play the boy for me as well". Born into a Lutheran family, Goethe's early faith was shaken by news of such events as the 1755 Lisbon earthquake and the Seven Years' War. He was one of the central figures in a great flowering of a highly influential Neo-Spinozism occurred in German philosophy and literature of the late eighteenth and early nineteenth centuries.—that was the first remarkable Spinoza revival in history. Like Lessing and Herder, in many respects, Goethe was a devoted Spinozist. He was also a pantheist, like some other prominent Spinozists such as Flaubert and Einstein. His later spiritual perspective incorporated elements of pantheism (heavily influenced by Spinoza's thought), humanism, and various elements of Western esotericism, as seen most vividly in part 2 of Faust. Like Heinrich Heine, Nietzsche, in his writings, frequently mentions Goethe and Spinoza as a pair. In the late 19th century Nietzsche wrote, "Four pairs it was that did not deny themselves to my sacrifice: Epicurus and Montaigne, Goethe and Spinoza, Plato and Rousseau, Pascal and Schopenhauer. With these I must come to terms when I have long wandered alone; they may call me right and wrong; to them will I listen when in the process they call each other right and wrong." And again, "When I speak of Plato, Pascal, Spinoza and Goethe, I know that their blood flows in mine—I am proud, when I tell the truth about them—the family is good enough not to have to poeticize or to conceal;". In 1884, Nietzsche restated, "My ancestors Heraclitus, Empedocles, Spinoza, Goethe" ("meine Vorfahren Heraclit Empedocles Spinoza Goethe"). From Nietzsche's point of view, Goethe was "not a German event, but a European one: a magnificent attempt to overcome the eighteenth century by a return to nature," and "he sought help from history, natural science, antiquity, and also Spinoza..." A year before his death, in a letter to Sulpiz Boisserée, Goethe wrote that he had the feeling that all his life he had been aspiring to qualify as one of the Hypsistarians, an ancient Jewish-pagan sect of the Black Sea region who, in his understanding, sought to reverence, as being close to the Godhead, what came to their knowledge of the best and most perfect. 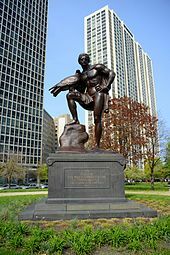 Goethe's unorthodox religious beliefs led him to be called "the great heathen" and provoked distrust among the authorities of his time, who opposed the creation of a Goethe monument on account of his offensive religious creed. August Wilhelm Schlegel considered Goethe "a heathen who converted to Islam." Politically, Goethe described himself as a "moderate liberal", expressing sympathy for the liberalism of Étienne Dumont. At the time of the French Revolution, he thought the enthusiasm of the students and professors to be a perversion of their energy and remained skeptical of the ability of the masses to govern. Goethe sympathized with the American Revolution and later wrote a poem in which he declared "America, you're better off than our continent, the old." He did not join in the anti-Napoleonic mood of 1812, and he distrusted the strident nationalism which started to be expressed. The medievalism of the Heidelberg Romantics was also repellent to Goethe's eighteenth-century ideal of a supra-national culture. Goethe was also a cultural force. During his first meeting with Napoleon in 1808, the latter famously remarked: "Vous étes un homme (You are a man)!" The two discussed politics, the writings of Voltaire, and Goethe's Sorrows of Young Werther, which Napoleon had read seven times and ranked among his favorites. Goethe came away from the meeting deeply impressed with Napoleon's enlightened intellect and his efforts to build an alternative to the corrupt old regime. Goethe always spoke of Napoleon with the greatest respect, confessing that "nothing higher and more pleasing could have happened to me in all my life" than to have met Napoleon in person. Germaine de Staël, in De L'Allemagne (1813), presented German Classicism and Romanticism as a potential source of spiritual authority for Europe, and identified Goethe as a living classic. She praised Goethe as possessing "the chief characteristics of the German genius" and uniting "all that distinguishes the German mind." Staël's portrayal helped elevate Goethe over his more famous German contemporaries and transformed him into a European cultural hero. Goethe met with her and her partner Benjamin Constant, with whom he shared a mutual admiration. In Victorian England, Goethe exerted a profound influence on George Eliot, whose partner George Henry Lewes wrote a Life of Goethe. Eliot presented Goethe as "eminently the man who helps us to rise to a lofty point of observation" and praised his "large tolerance", which "quietly follows the stream of fact and of life" without passing moral judgments. Matthew Arnold found in Goethe the "Physician of the Iron Age" and "the clearest, the largest, the most helpful thinker of modern times" with a "large, liberal view of life." It was to a considerable degree due to Goethe's reputation that the city of Weimar was chosen in 1919 as the venue for the national assembly, convened to draft a new constitution for what would become known as Germany's Weimar Republic. Goethe became a key reference for Thomas Mann in his speeches and essays defending the republic. He emphasized Goethe's "cultural and self-developing individualism", humanism, and cosmopolitanism. Goethe's scientific and aesthetic ideas have much in common with Denis Diderot, whose work he translated and studied. Both Diderot and Goethe exhibited a repugnance towards the mathematical interpretation of nature; both perceived the universe as dynamic and in constant flux; both saw "art and science as compatible disciplines linked by common imaginative processes"; and both grasped "the unconscious impulses underlying mental creation in all forms." Goethe's Naturanschauer is in many ways a sequel to Diderot's interprète de la nature. His views make him, along with Adam Smith, Thomas Jefferson, and Ludwig van Beethoven, a figure in two worlds: on the one hand, devoted to the sense of taste, order, and finely crafted detail, which is the hallmark of the artistic sense of the Age of Reason and the neo-classical period of architecture; on the other, seeking a personal, intuitive, and personalized form of expression and society, firmly supporting the idea of self-regulating and organic systems. George Henry Lewes celebrated Goethe's revolutionary understanding of the organism. W.H. Murray – author of misattributed quotation "Until one is committed ..."
^ "Goethe". Merriam Webster Dictionary. ^ "Goethe". Random House Webster's Unabridged Dictionary. ^ "Classical Weimar UNESCO Justification". Justification for UNESCO Heritage Cites. UNESCO. Retrieved 7 June 2012. ^ a b Schopenhauer, Arthur (January 2004). The Art of Literature. The Essays of Arthur Schopenahuer. Retrieved 22 March 2015. 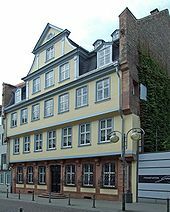 ^ Catharina was the daughter of Johann Wolfgang Textor, sheriff (Schultheiß) of Frankfurt, and Anna Margaretha Lindheimer. ^ "Originally speech of Goethe to the Shakespeare's Day by University Duisburg". Uni-duisburg-essen.de. Retrieved 17 July 2014. ^ Hume Brown, Peter (1920). Life of Goethe. pp. 224–25. Chisholm, Hugh, ed. (1911). "Stein, Charlotte von" . Encyclopædia Britannica (11th ed.). Cambridge University Press. ^ Wilson, W. Daniel (1999). Das Goethe-Tabu [The Goethe Taboo: Protest and Human Rights in Classical Weimar] (in German). Munich: Deutsche Taschenbuch Verlag (dtv). pp. 49–57, also the entire book. ISBN 978-3-423-30710-9. ; "The Goethe Case by W. Daniel Wilson" – The New York Review of Books. ^ Safranski, Rüdiger (1990). Schopenhauer and the Wild Years of Philosophy. Harvard University Press. ISBN 978-0-674-79275-3. ^ Briscoe, J. R. (Ed.). (2004). New historical anthology of music by women (Vol. 1). Indiana University Press. Pgs. 126-127. ^ Todd 2003, pp. 188–90, 269–70. ^ Carl Vogel: "Die letzte Krankheit Goethe's". In: Journal der practischen Heilkunde (1833). ^ See, generally Schiller, F. (1877). Correspondence between Schiller and Goethe, from 1794 to 1805 (Vol. 1). G. Bell. ^ Baumer, Rachel Van M.; Brandon, James R. (1993) . Sanskrit Drama in Performance. Motilal Banarsidass. p. 9. ISBN 978-81-208-0772-3. ^ "The Stigma of Suicide – A history". Pips Project. Archived from the original on 6 October 2007. See also: "Ophelia's Burial". ^ Wigmore, Richard (2 July 2012). "A meeting of genius: Beethoven and Goethe, July 1812". Gramophone. Haymarket. Retrieved 6 July 2012. ^ Holm-Hadulla, Rainer Matthias (2012). "Goethe's Anxieties, Depressive Episodes and (Self-) Therapeutic Strategies: A Contribution to Method Integration in Psychotherapy". Psychopathology (46): 266–74. ^ Holm-Hadulla, Rainer Matthias; Roussel, M; Hofmann FH (2010). "Depression and Creativity – The Case of the German Poet, Scientist and Statesman J.W. v. Goethe". Journal of Affective Disorders (127): 43–49. ^ Poetry and Truth, vol. 1, p. 252. ^ "Johann Wolfgang von Goethe". The Nature Institute. Retrieved 28 August 2008. ^ Darwin, C.R. (1859). On the origin of species by means of natural selection, or the preservation of favoured races in the struggle for life (1st ed.). John Murray. ^ K. Barteczko and M. Jacob (1999). "A re-evaluation of the premaxillary bone in humans". Anatomy and Embryology. 207 (6): 417–37. doi:10.1007/s00429-003-0366-x. PMID 14760532. ^ Goethe, J.W. Italian Journey. Robert R Heitner. Suhrkamp ed., vol. 6. ^ Versuch die Metamorphose der Pflanzen zu Erklären. Library of Congress. Retrieved 2 January 2018. ^ Magnus, Rudolf; Schmid, Gunther (2004). Metamorphosis of Plants. ISBN 978-1-4179-4984-7. Retrieved 28 August 2008. ^ Balzer, Georg (1966). Goethe als Gartenfreund. München: F. Bruckmann KG. ^ Bockemuhl, M. (1991). Turner. Taschen, Koln. ISBN 978-3-8228-6325-1. ^ Goethe, Johann (1810). Theory of Colours, paragraph No. 50. ^ "Goethe's Color Theory". Retrieved 28 August 2008. ^ "The Experiment as Mediator between Subject and Object". Archived from the original on 10 November 2011. Retrieved 26 June 2014. ^ "The Theory of Knowledge Implicit in Goethe's World Conception". 1979. Retrieved 28 August 2008. ^ "Goethe's World View". Retrieved 28 August 2008. ^ Holm-Hadulla, Rainer Matthias (2018). Goethe's Path to Creativity. A Psycho-Biography of the Eminent Politician, Scientist and Poet. Routledge, Taylor and Francis Group, ISBN 978-1-138-62602-7. ^ Goethe, Johann Wolfgang (1976). Gedenkausgabe der Werke, Briefe und Gespräche. Zürich : Artemis Verl. p. 686. Retrieved 27 April 2016. ^ Bullough, V.L. (1990). History in adult human sexual behavior with children and adolescents in Western societies (Pedophilia: Biosocial Dimensions ed.). Springer-Verlag New York Inc. p. 72. ISBN 978-1-4613-9684-0. Retrieved 27 April 2016. ^ Farrelly, Daniel J. (1998). Goethe in East Germany 1949–1989: Toward a History of the Goethe reception in the GDR. p. 126. ISBN 978-1-57113-065-5. Retrieved 17 July 2014. ^ Goethe, Johann Wolfgang von; Eckermann, Johann Peter; Soret, Frédéric Jacob (1850). Conversations of Goethe with Eckermann and Soret, Vol. II, pp. 423–24. Retrieved 17 July 2014. ^ Moltmann, Jurgen; Moltmann, Jürgen (2001). The Crucified God: The Cross of Christ As the Foundation and Criticism of Christian Theology, SCM Press, London, 1973, pp. 27–28. ISBN 978-0-334-02835-2. Retrieved 17 July 2014. ^ Thompson, James (1895). Venetian Epigrams. Retrieved 17 July 2014. ^ Venetian Epigrams, 66, ["Wenige sind mir jedoch wie Gift und Schlange zuwider; Viere: Rauch des Tabacks, Wanzen und Knoblauch und †."]. The cross symbol he drew has been variously understood as meaning Christianity, Christ, or death. ^ Forster, Michael N.: Herder's Philosophy. (Oxford: Oxford University Press, 2018). Michael N. Forster (2018): "Lessing, Herder, and Goethe; Hölderlin; the German Romantics Schleiermacher, Friedrich Schlegel, and Novalis; the German Idealists Schelling and Hegel — all of them subscribed to one or another version of Spinoza's monistic, deterministic metaphysics." ^ Gálik, M. (1975), 'Two Modern Chinese Philosophers on Spinoza (Some Remarks on Sino-German Spinoza's „Festschrift“),'. Oriens Extremus 22(1): 29–43. M. Gálik (1975): "...The Germans, however, were the first to manifest serious interest in him. Their first great philosopher Leibniz went to seek his advice and his counsel; they were the only ones to invite him to lecture at their university. Even though Leibniz concealed him from the world, the Germans revealed him to the world. The generation of their greatest philosophers and poets from the second half of the 18th and the first half of the 19th centuries grew up under his influence. Goethe read him together with Charlotte von Stein, and even read him together with her in Latin. To Hegel, Spinoza was "der Mittelpunkt der modernen Philosophie"." ^ Melamed, S. M.: Spinoza and Buddha: Visions of a Dead God. (Chicago: University of Chicago Press, 1933). S. M. Melamed (1933): "...Not only Goethe's poetry but his science is Spinozistically motivated. Convinced of the oneness of nature, he approached it with a certainty to discover in it oneness, and his discovery of the os intermaxtllare in man, which influenced the development of comparative anatomy, is one of the by-products of his Spinozistic sentiments. In his theory of the metamorphosis of the plants, which he expounded scientifically and poetically, he also expressed a good deal of Spinozism. Spinoza enabled him to read the various pages of nature as one book. Goethe respected Kant and may be described as a Kant scholar, but he was a Spinoza adherent. His world-picture is Spinozistic and not Kantian." ^ a b Krimmer, Elisabeth; Simpson, Patricia Anne (2013). Religion, Reason, and Culture in the Age of Goethe. Boydell & Brewer. p. 99. ^ Selth, Jefferson P. (1997). Firm Heart and Capacious Mind: The Life and Friends of Etienne Dumont. University Press of America. pp. 132–33. ^ Mommsen, Katharina (2014). Goethe and the Poets of Arabia. Boydell & Brewer. p. 70. ^ Unseld, Siegfried (1996). Goethe and His Publishers. University of Chicago Press. pp. 36–37. ^ Gemünden, Gerd (1998). Framed Visions: Popular Culture, Americanization, and the Contemporary German and Austrian Imagination. University of Michigan Press. pp. 18–19. ^ Unseld, Siegfried (1996). Goethe and His Publishers. University of Chicago Press. p. 212. ^ Richards, David B. (1979). Goethe's Search for the Muse: Translation and Creativity. John Benjamins Publishing. p. 83. ^ Beachy, Robert (2000). "Recasting Cosmopolitanism: German Freemasonry and Regional Identity in the Early Nineteenth Century". Eighteenth-Century Studies. 33 (2): 266–74. JSTOR 30053687. ^ Will Durant (1967). The Story of Civilization Volume 10: Rousseau and Revolution. Simon&Schuster. p. 607. ^ Friedenthal, Richard (2010). Goethe: His Life & Times. Transaction Publishers. p. 389. ^ a b Broers, Michael (2014). Europe Under Napoleon. I.B. Tauris. p. 4. ^ Swales, Martin (1987). Goethe: The Sorrows of Young Werther. CUP Archive. p. 100. ^ Merseburger, Peter (2013). Mythos Weimar: Zwischen Geist und Macht. Pantheon. pp. 132–33. ^ Ferber, Michael (2008). A Companion to European Romanticism. John Wiley & Sons. p. 450. ^ a b c Gillespie, Gerald Ernest Paul; Engel, Manfred (2008). Romantic Prose Fiction. John Benjamins Publishing. p. 44. ^ a b Röder-Bolton, Gerlinde (1998). George Eliot and Goethe: An Elective Affinity. Rodopi. pp. 3–8. ^ Connell, W.F. (2002). The Educational Thought and Influence of Matthew Arnold. Routledge. p. 34. ^ a b Mundt, Hannelore (2004). Understanding Thomas Mann. Univ of South Carolina Press. pp. 110–11. 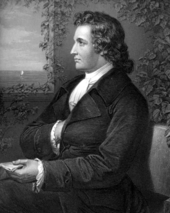 ^ "The literary estate of Goethe in the Goethe and Schiller Archives". UNESCO Memory of the World Programme. Retrieved 29 September 2017. ^ Richter, Simon J. (2007). Goethe Yearbook 14. Harvard University Press. pp. 113–14. ^ Amrine, F.R. ; Zucker, Francis J. (2012). Goethe and the Sciences: A Reappraisal. Springer Science & Business Media. p. 232. ^ a b c Roach, Joseph R. (1993). The Player's Passion: Studies in the Science of Acting. University of Michigan Press. pp. 165–66. ^ a b c Fellows, Otis Edward (1981). Diderot Studies. Librairie Droz. pp. 392–94. Mercer-Taylor, Peter (2000). The Life of Mendelssohn. Cambridge, England: Cambridge University Press. ISBN 978-0-521-63972-9. Todd, R. Larry (2003). Mendelssohn – A Life in Music. Oxford, England; New York, NY: Oxford University Press. ISBN 978-0-19-511043-2. Wikimedia Commons has media related to Johann Wolfgang von Goethe.